Thank you for submitting questions for this Q&A Part 2! I really enjoyed seeing the things you wanted to know. If you missed Part 1, it’s here. Without further ado…. In Iceland Intrigue, are there new characters introduced? What gave you the idea to put the story setting in Iceland? Will there be a 7th Baker Family adventure? I’d love that! Would you be keen to read it if I write it? 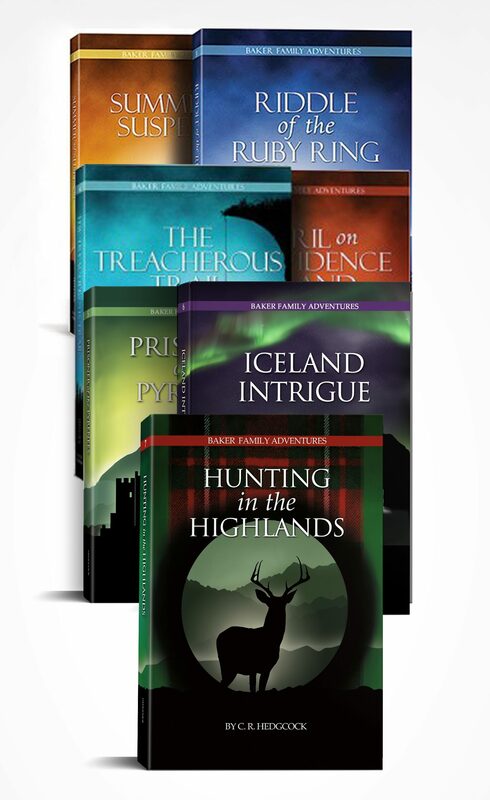 How long did it take you to write the Iceland Intrigue? At least 18 months. It was a real challenge to write, and this surprised me after the ease of writing Prisoner of the Pyrenees. Part of the difficulty lay in the fact that I’d started writing book 6 set in a fictional country. After my trip to Iceland, I had to decide whether to adapt the plot or start again. I salvaged what I could, but that turned out to be very little. The plot became about potentially world-changing inventions, and this required lots of extra research. Hardly any of it shows in the book, but this is what writing sometimes looks like — exploring options, looking for treasures, and taking the plunge to cut out chapters (and tens of thousands of words) that don’t need to be there. Do you plan out your stories, or do you just write what comes to mind? This varies from book to book. Most of the time, I start out with a premise (for example, what if the Bakers help an injured hiker and he turns out to be someone extremely dangerous? – Treacherous Trail) and go from there. With Iceland Intrigue, I made more of a concerted effort to form a plot outline. I find it harder to plan out the story from beginning to end right at the start, but the more of the story I can see in advance, the quicker it can be to fill out. Have you ever thought about Phil, Abby and Andy becoming spies? Out of the twins, probably Abby is older. Also . . . is Briosa in Iceland Intrigue? Briosa is in book 6 a tiny bit at the beginning of Iceland Intrigue. I’ve been getting more than one query about Briosa! Did you like her? How many of the places you took pictures of will be featured in Iceland Intrigue? My last post had pictures of the church (Hallgrimskirkja), geothermal energy landscapes, a famous waterfall (Skogafoss), and Harpa opera house. In short, all of the above (and MORE) plays a part in Iceland Intrigue! While I don’t mention Skogafoss specifically, there is a waterfall in the story. Will any characters enter into a romantic relationship? This is a great question! There are two main reasons why I haven’t included romance in any of the books as of yet. First and foremost, there seem to be a lot of books out there that have romance as their primary plot line. While romance is a part of life and is something that glorifies God, I’ve tended to think there’s a lot of literature that blows it out of proportion. From the start, I wanted to create rollicking, constructive adventures that show the joys of a family working together, and the refreshing situations of characters helping others in a platonic way. This has always been the thrust of the Baker Family Adventure series. If characters do enter into romantic relationships in the future, I’ll aim to keep it within that framework and context. Secondly, my target audience starts at age nine, and I want to make sure parents are comfortable with what I choose to include. And that’s all the questions for this time. If you have more queries, you can send them my way via the contact page or Facebook. Is there anything you want me to explain further? Let me know in the comments! I’m planning to share a few more Behind-the-Scenes photos via newsletter, so if you aren’t signed up yet for that, the link is HERE. Oh Ms. Hedgcock , this is a very exciting and interesting post!!! We would love a 7th book , and the idea of a “Bakers dozen” is quite appealing!!! I would love a book 7!!! I can’t wait to read book 6. I’m hoping to get it for Christmas:) I’ve really been enjoying these Q and A posts. I really admire you for taking the plunge to write a story in a real place and doing all the research that goes with it. This is an impressive achievement!!! I’m glad that your stories don’t have romance! As a 17 year old trying to live a Christian life in a world that is always tempting you with romance, it’s very refreshing to read something without it. Thank you for what you are doing! You are blessing so many people! I agree!! I’m 15 and found this series very enjoyable without romance though I think it may be a good way (carefully of course) to tie off the series when she decides to discontinue writing it. Thank you, girls! That is wonderful feedback. It did take a lot of time and research to set the story in Iceland, but it was so worth it! I love the Baker Family Adventure Series! It is very encouraging for me ( as a homeschooler) to read exciting adventures about a HOMESCHOOLED family. In this day and age, finding clean and pure books to read is difficult so I appreciate C. R. Hedgecock for her work in writing this series. I pray the Lord will bless her as she continues to write books! I hope she will write a seventh Baker book very soon!!!!!!!!!!!!!!!!!!!!! Thank you for your lovely words and prayer, Cherish! I am so blessed by all of your comments–Hannah, Elizabeth, Meg, Savannah, and Cherish–and it’s great that you enjoyed the Q&A. As for Baker Family adventure #7 … I’m so glad you’re excited for it! God bless you richly as you continue writing for Him.